Taking to the air for the first time in 1973, the Polish-made SZD-45 was and still is a unique motor sailplane, built by PZL Bielsko. Its cockpit will seat two people, side by side, offering a great unobstructed view for both pilot and passenger. It was deigned for touring and instructing new pilots and can cruise at better than 85 knots. Some 60 examples were manufactured, many of which were imported in to the U.S. This full-scale aircraft design lends itself well to scale sailplane buffs as well those pilots wanting to fly with video equipment on board, including those who wish to fly in “first-person-view” (FPV) mode. The spacious cockpit/cabin area is simply huge by RC model standards. The subject of this review is the Ogar, as made by The Wings Maker and imported by Airborne Models. From out of the box, the motor is installed, prop and spinner is attached and all you need to do is to hook up your ESC and plug it into the receiver. WING AREA: 667 sq. in. WING LOADING: 9.75 oz./sq. ft. The SZD-45 Ogar seems to fit at least three different needs for a modeler; it is a sport-scale model, it is a powered sailplane for those who don’t want to invest in a winch or hi-start and it makes a pretty steady camera or FPV platform with its stable flight handling. Whatever the main attraction is, the Ogar (Polish for “Greyhound”) is unique and does a very credible job in every direction. The cabin area is huge and can swallow a good sized payload inside where it won’t disturb the aerodynamics. The electric power system is powerful enough to get into the air rapidly and can be at thermal height in a minute. This plane is actually a kick to fly! You don’t find too many sailplanes that can do a touch-and-go routinely. The Ogar is so unique and utilitarian that you can’t help but like it! > The model can carry a huge payload with its spacious cockpit area. Just be careful of your balance point. > The finish of the foam material is smooth and devoid of typical mold marks and “beading” cracks. > Because of the nice surface finish, giving the SZD-45 a custom or scale paint job will be easier and much nicer looking. > This model is capable of going from box to flying field in less than an hour. I would start with the wings, but in the case of the Ogar, there is literally nothing to do! In fact, this model even provides you with a very nice wing bag to protect the wings! They definitely want you to take care of this model. To mount the wing, locate the fiberglass wing joining rod in the wing bag and insert it evenly through the fuselage. Slide the two wing panels on and join them to the wing saddle using the short rubber band. The hardware bag has a wire hook tool to help you pull the rubber band through the fuselage toward the other wing half. Some people might think this is too simple, but I assure you that it is plenty adequate for the job. As the wings mate to the wing saddle, the aileron servo wires are inserted through the saddle and into the cabin area where a kit supplied “Y” connector is used to connect to the receiver. At the tail, you actually get to glue something, this being the horizontal stabilizer. Note that the elevator servo is mounted inside the stab and has the servo wire already extended long enough to reach the cabin. Knowing that, you realize that you need to snake the servo wire through the fin, down the tail boom and into the cabin. Not to worry, as the Ogar has a pull string running from the top of the fin all the way to the cabin. I will say that it will go much easier and faster if you remove the rudder servo, which is mounted in the fin and then begin snaking the elevator servo wire. You will need to make the turn from the vertical fin and into the tail boom with the wire and you can guide it by hand by removing the rudder servo. Snake the wire and then epoxy the horizontal stab in position. By the way, both the elevator and rudder are hinged and pushrods installed from the factory…nice! 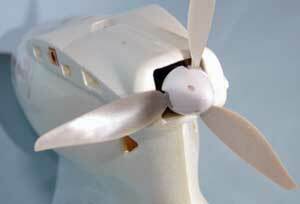 Going to the cabin, you will find the KMO283010 brushless motor already in position, including the prop and spinner. What is strange is that the Ogar uses a 9×6 three (3) blade, folding prop assembly, that won’t fold back. Remember that this is a pusher prop plane, and so the prop should fold over the spinner, but it can’t because the prop folds the wrong way for a pusher prop configuration. Inside the cabin, there is a small plywood tray at the rear of the cabin, meant for mounting the ESC. I elected to use an E-flite Pro Switch mode BEC 30-Amp ESC, but could not fit my fingers into the cabin to make the connections. Not to worry, as I simply ran the motor wires up through the top air intake vent, connected up the motor wires and then passed the whole thing back through the intake. Perfect! Our maiden flights took place in two locations inside of San Diego, CA. The day was sunny with just a mild breeze right down the runway. After a complete functional check and range check, I set the Ogar on the runway resting on the aircraft stand/launch dolly, facing into the wind. The dolly has very small plastic wheels, demanding that they be used on a smooth, hard surface. With everything in tune with the pilot, I opened up the throttle and began the take-off run. She was up in about 50 feet, leaving the launch dolly behind on the ground. I added about four clicks of up elevator trim and the Ogar was flying hands-free. That takeoff was good, but we failed to get any photos of the launch so I landed immediately to launch again. Remember that thing about the launch dolly having very small, plastic wheels? Well, it was this second pass that showed us you need a smooth, hard runway. The field we were flying from is certainly smooth enough, but it is a dirt field with areas of loose soil. On the second launch, the wheels hit some of that loose soil and pulled the dolly away and to one side. The dolly popped up in the area of the prop arc and soundly impacted the prop, breaking the blades. Nothing else was damaged or hurt, but this forced us to use the second flying site of the day, the world famous cliffs of Torrey Pines, Calif.
Torrey Pines is a sailplane pilot’s dream spot for slope soaring and we were looking at a steady 10mph wind into the face of the cliffs. Perfect! With a staunch hand launch, the Ogar was instantly at home over the ocean. She is solid and very stable. Right then, I was convinced that whoever had the idea of making this model into a flying video platform hit it right on the top of the nail! In fact, I could see the wind turbulence shake the wings but the fuselage hardly moved at all. There’s no doubt that with the light wing loading, you could truly load this model up and not disturb the handling a bit. The Ogar is not fast by any stretch of the imagination, with a top speed of about 40mph from a mild dive, but it is fun to fly. You do have to think ahead of the model as the control response is subdued. In the case of the Ogar, think ahead of it by three seconds. It has no bad habits, and if there are any to be found, you would normally see that on the slopes fairly quickly. She does look realistic and even majestic. By the way, you don’t need the launch dolly to get the Ogar into the air. A good hand launch works easily and we found that if you hold the wings level for the first few feet of the takeoff run under power, the Ogar can lift off using only the centerline wheel. For those pilots with a grass field, the hand launch is the ticket. If you are looking to perform aerobatics, then look away in another direction; the Ogar is not the best candidate for aerobatics. You can coax a roll or a loop out of her, if you know what you’re doing and you have altitude, but don’t expect it to look pretty. The stall is gentle, and under normal flight speeds, recovery is rapid. It will tend to fall off to one side or another, but not harshly. You will have plenty of warning before the stall occurs. In the thermal mode, the Ogar is not going to signal lift like a competition model, but it does let you know when it engages solid lift by lifting the tail and accelerating mildly. I found that it thermals more efficiently using flat, rudder turns rather than a steeper, faster turn; typical sport sailplane technique. Landing the Ogar is simple. Just line her up at a good distance out and start letting her fall gently to allow a shallow descent to the numbers. You want to be at 10 feet over the threshold and then remove power. Hold her level and she eases right in. If you liked that, then add power and do it again because this is a powered glider and you can do touch-and-go passes on only the centerline wheel. It had me smiling for some time! The Wings Maker SZD-45 Ogar is actually quite a standout model, fulfilling a multi-purpose role of being a sport scale model, a motor glider and a very good platform for shooting airborne video or flying FPV missions. Although the recommended battery is only an 1800mAh 3S LiPo pack, the nose can easily hold a pack of twice the capacity for much longer flight times. With a bit of help from the local thermals, you can expect 20 minute flights or longer from the battery. The only major problem I had was wondering why the Ogar is equipped with a folding prop that cannot fold in the correct direction. It would be awesome if it did fold correctly. The launch dolly is a great idea, but could use larger wheels to be truly useful. The model is reinforced where it needs to be, and the hardware outfit even includes some unique, helpful tools. The Ogar is well engineered, well executed and it is entertaining to fly. How entertaining? It just caused me to order a new sport video camera to install in the nose! I’m going to have some fun!